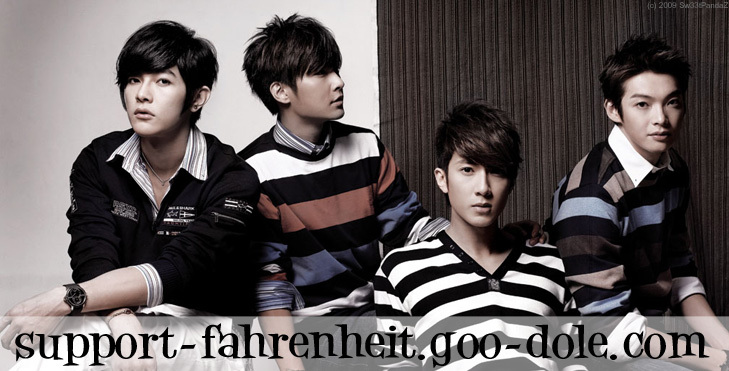 On this 31st May 2008,Fahrenheit member(all 4) will be at THE Canon event @ KLCC...The time is 2.30 p.m as a representative for a camera company. By the way, any idea if they intend to go to Europe/USA? nope.. xD i cbf to atm.. xD but i will. xD u can just go one thier site and look. the only part u cant go and do stuff is the fanclub part. I just thought that the one in the portal was a general event or celabration only. say holidays and the like. Anyway thanks!!! hi would you know if they'll be touring around october to november? on the 19th, june 08, they're going to have a "wild day out"
will fahrenheit be going to the philippines anytime soon?? Only Chun and Calvin. They are scheduled for rp promotion on july 12-14.
on the 10dec, on some FMs they will be playing some of their new songs..
i am not sure of the actual date of the release of the new album:<<yue lai yue ai>>. and on zhong shi ye xian. this i dunno what about it. LOLZ.. hey.. becareful not to double post!! oh.. sorry.. do u mean not to put two post next to the other one?? That's alright. I merged it. Now let's not get out of topic here, this isn't a topic to talk freely. It's basically here to inform the admins to update schedules; nothing else.